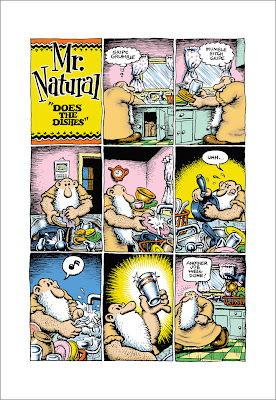 Originally published in black and white on the inside cover of the Mr. Natural #2 comic book (1971), this image was released in color as a tin sign by Kitchen Sink Press in 1995. But Robert was not completely happy with the colors. For this edition he created a beautiful color rough with watercolor, which Wildwood Serigraphs translated faithfully into this 16-color edition. We made it slightly smaller than our usual prints so it could fit in most kitchens (Robert likes his images smaller anyway, but that's another story.) Each print comes with its own certificate of authenticity, which has copy written by Robert on both front and back. Printed on Rives BFK 100% archival rag. Wildwood Serigraphs guarantees your complete satisfaction, or your money back.